After 16 years and four albums, Vancouver, BC punk rock stalwarts the Black Halos have officially called it quits. The only issue is the band can't agree on when that exactly happened. Front-man Billy Hopeless told Punknews the group were done in August, saying: "At the best the Halos was always a band that I would have loved to go see and hear. At worse it was everything that I despise and I battled to keep it as exciting and hard as I could." Still, guitarist Adam Becvare said the band imploded in the spring of 2008, right after their van, gear and merch were stolen in Montreal. 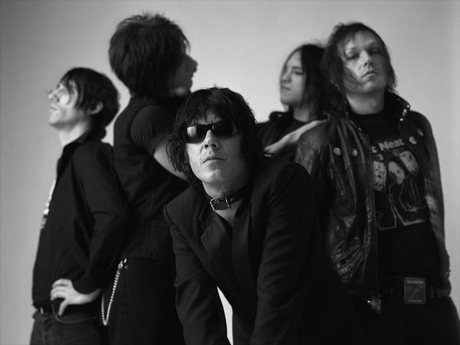 Speaking with Chart, he said: "We'd just replaced two members when our van, trailer and everything we had was gone... As a founder, it's Bill's choice when to call it dead, but after Europe [in] June '08 my LustKillers were already touring the earth for our release, Black Sugar Sessions. Not one thing has happened for the Black Halos since." Either way, the band are completely done. Hopeless is now fronting the Bonitos, guitarist Jay Milette is now a member of Darlings of Chelsea and Becvare is in his previously mentioned LustKillers project.